Percocet is a combination of oxycodone and Acetaminophen. Oxycodone is in a class of drugs called narcotic analgesics. Acetaminophen is a less potent pain reliever that increases the effects of oxycodone when taking in combination. Together, acetaminophen and oxycodone are used to relieve moderate-to-severe pain. It is considered an opiate. It is classified as a Schedule II drug, meaning it has a high potential for drug addiction and is only available by prescription from a licensed physician. Oxycodone (the active ingredient in Percocet) is one of the most powerful medications for pain control that can be taken orally. Percocet tablets (oxycodone with acetaminophen) are routinely prescribed for post-operative pain control. 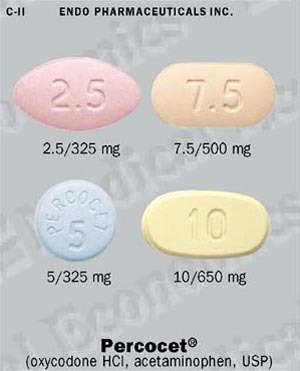 Percocet is also used in treatment of moderate to severe chronic pain. When used at recommended doses for relatively short periods (several weeks), it provides effective pain control with manageable side effects. According to the DEA and the companies that manufacture the drug, psychological addiction as a result of medical use is extremely rare. However, there are several lawsuits underway brought by plaintiffs who claim that they became addicted to the drug as a result of medical use. Tolerance and physical dependence occurs after several months of treatment, with larger doses being required to achieve the same degree of analgesia. unusual fatigue, bleeding, or bruising. Symptoms of a Percocet overdose include slow breathing, seizures, dizziness, weakness, loss of consciousness, coma, confusion, tiredness, cold and clammy skin, small pupils, nausea, vomiting, and sweating.